(2) After creating my VLAN interface, nothing happened. No new interface appeared. I then realized that I had not installed the "vlan" package, and assumed that NetworkManager therefore could not complete configuration of the interface. (3) After installing the 'vlan' package (and then telling NetworkManager to disconnect and reconnect my Ethernet interface from the UI, just for good measure), still no VLAN interfaces were present on my system. I also tried editing the VLAN interface in the UI, and specifying "enp4s0f1.100", but still no VLAN interface came online. After I rebooted, the "vlan100" interface was created. So perhaps this bug just has to do with the fact that I tried to configure the a VLAN without the 'vlan' package installed. This was working on 14.04. Failed to bring up enp3s0.345. It splits vlan number from interface name and creates vlan interface. It works with interface named eth, em, bond, vlan and doesn't work with systemd predictable network interfaces names (https://www.freedesktop.org/wiki/Software/systemd/PredictableNetworkInterfaceNames/). The attachment "vlan.patch" seems to be a patch. If it isn't, please remove the "patch" flag from the attachment, remove the "patch" tag, and if you are a member of the ~ubuntu-reviewers, unsubscribe the team. This is similar to LP: #1541678 which has a simpler and more generic patch. How does the script in /etc/network/if-pre-up.d have anything to do with this bug? I thought that was placed there for ifupdown. This bug is about configuring VLANs with Network Manager, so that script shouldn't be relevant here. (0) Install the "vlan" package. 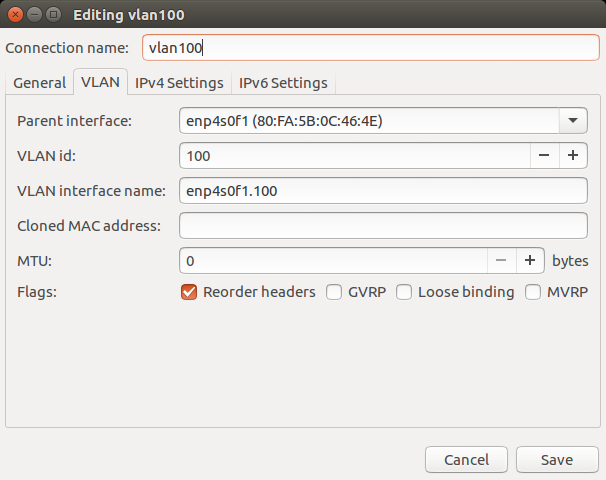 (2) Go to the "IPv4 Settings" tab and configure the VLAN appropriately. This all seems to work for me now. That said, the user experience isn't as nice as it could be. (Either the "vlan" package should be installed by default, or I should be prompted to install it.) And I have to type way too much redundant information in the UI. But it seems to be working properly for me now. The user experience of the dialog in the screenshot is a separate concern. Since it looks like network-manager needs to pull in 'vlan' by default, here is a debdiff that adds it to recommends. It may make sense to write a patch that grays out menu entries for network types which do not have the required deps installed, but this may have to wait until later. Actually, in hindsight after renaming the bug, it looks like there are two bugs identified here. 1) NetworkManager does not depend on or recommend the vlan package, and silently breaks when it isn't installed; and 2) from comments 4 and 5, there is a separate issue with a glob match for NICs in ifupdown. Since Mike filed this bug originally, I think it makes sense to track this bug as the first issue. For the second issue, SwaJime and Arnaud, please could you use a separate bug to track this? It's the second issue I spotted that caused me to assign Wes this bug, but thank you for looking at the NetworkManager GUI issue too! One complication is that this change would pull vlan onto a bunch of CD images. I'd like feedback from the release or SRU teams before sponsoring this. Or, Mathieu, as this is Network Manager related, would you mind chiming in please? The "Team" option seems to be a Red Hat technology (in 'universe' in Ubuntu) which should probably be hidden from the menu unless the dependency is installed (separate issue). This bug affects 16.04 LTS - the supplied patch above fixes the issue. Interfaces such as enp3s0.100 cannot be brought up without this. The vlan merely provides integration into ifupdown, it is not required for NM at all. I cannot reproduce this -- I just added a VLAN device in NM and that works fine without the "vlan" package. However, you need to disconnect and re-connect the underlying device (or reboot), so I guess trying to install the package was a red herring. But keeping the bug open for the "must fill in vlan name" -- personally I think this is okay, but let's keep it as a wishlist bug. Unsubscribing sponsors as there are no applicable NM patches here.